Home / Food / Lucille’s Smokehouse Bar-B-Que a dinner to remember! Lucille’s Smokehouse Bar-B-Que a dinner to remember! When I go to eat out with my family, I try to find somewhere to go that I am going to feel comfortable and where I am wanted. I found both of these things in abundance at Lucille’s Bar B Que. Nick the manager at this location at Main Place Mall in Santa Ana is so incredible. When we arrived we were led to a big bright booth with a huge window that opened and gave us a great view of outdoors, and most of their booths had this view from the bar all the way to the start of the main dining room, it gave a feel of sitting down at a lanai. My husband, my daughter in law, my grand-daughter and myself had no idea what we were in for in this fabulous restaurant. We were greeted and spoken to like we went to visit a neighbor or old friend, everyone was so friendly and hospitable. We ordered our drinks and a couple of appetizers and started to flip through the menu to figure out what we wanted to have for our dinner. 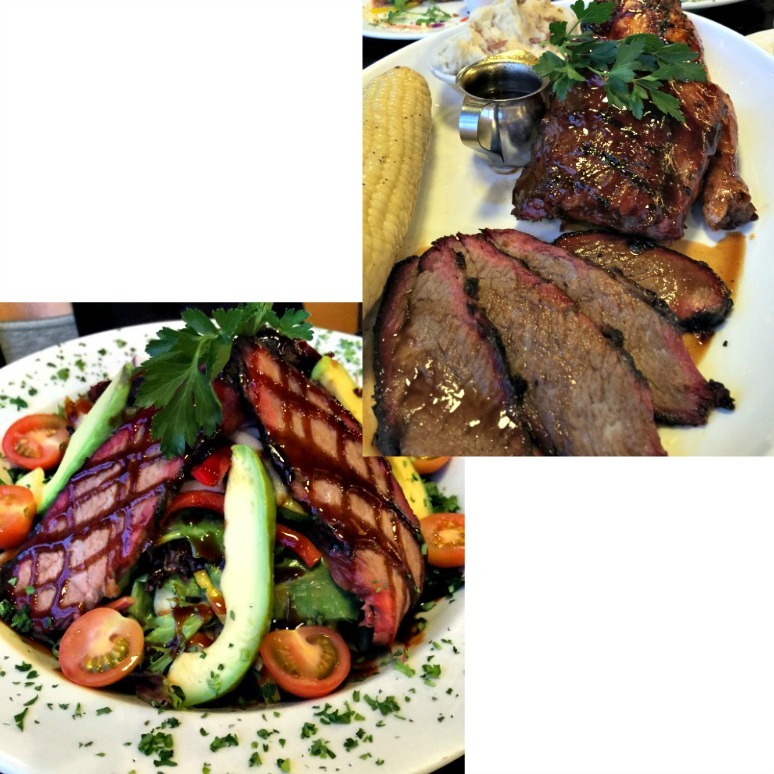 This was no easy feat as we had so many fabulous things to choose from, my husband ordered the catfish and shrimp, I ordered the front porch platter so that I could try the tri tip, chicken and ribs, my daughter in law ordered a tri tip salad and Destini ordered pasta. I was impressed with the selection of entrees for kids as well as adults. We had some fried pickles, I figured if you are going to go southern food that would fit the bill perfectly. They were amazing, very hot on the inside, for some reason pickles hold their heat well, but the flavor was great, not too garlicky and not too spicy but it had enough to waken your taste buds to know you were going to get a great dinner to come! We also order some chicken strips as it seems to be a standard for most restaurants and I always want to compare them. These were like fried chicken from grandmas moist and juicy not overly breaded but they had such an amazing flavor. I would later learn from Nick that they had this flavor because at Lucille’s they have a scratch kitchen, and all of their own recipes, you knew it was all going to taste great! We were delivered these fabulous biscuits, that I know someone’s aunt is making in the back so they are fresh and hot continuously. They are made with a sprinkling of sugar on them and served with homemade apple butter. Just out of this world with flavor. When the entrée’s came we were again blown away at the freshness and wholesome flavors we had. My food from the chicken to the ribs was superb, the bar b que sauce was flavorful and full-bodied without being overly done, I was led to really just want more. The catfish and shrimp were an enormous portion that was fried to perfection and very flavorful, my husband loved the garlic mashed potatoes, they were well-balanced without lacking flavor or being completely over garlic, it is a hard balance, but Lucille’s pulled it off beautifully. Tri Tip on salad was not something I had expected to like, but this salad was so plentiful and full of brightly colored vegetables, not only did it look beautiful the flavors together was something I will always remember. Destini was so happy that they did not put sauce on her pasta as she is often brought pasta with a heavy hand of sauce and really does not like it. When it came time for dessert our friend Nick did not steer us wrong, we were brought some decadent desserts that I could have anytime! Snickers pie, peach cobbler, banana pudding, and chocolate cupcake with ice cream inside, it was all very inviting. I try often to have cobbler at restaurants and honestly none of it has passed as true cobbler until I tried this at Lucille’s it was crunchy and cooked to perfection the peaches were sweet and tender with a great fresh flavor, it was a true cobbler with fruit on the bottom and a tender crust on top. It was the first that I have had that reminded me of my family recipe. The other desserts, were so good and each of them tasted like they could win a blue ribbon at the country fair. My family and I are all huge dessert fans so this lay out was just perfect for us. The real prize at Lucille’s is the people, from the bartender, waitresses, hostesses and even Nick the manager are so kind, and accommodating. They were always smiling and helpful and were honestly the best part of dinner. Food can taste good but, you wont taste it right if you are not served with a smile and greeted like you are a regular. Even though we had never been before, we were treated like we were there everyday, I wanted to have them all over to my house for coffee when we were done. If you are looking for a fabulous time with good food, and even better service this is the place to go. Main Place Mall is so clean and well maintained it was a pleasure to find and to dine here. I think that Lucille’s has found a good home here and they are going to be a fabulous asset to the mall.